During the Revolutionary War, a primitive submarine called the Turtle was used to attack a British flagship in New York harbor. 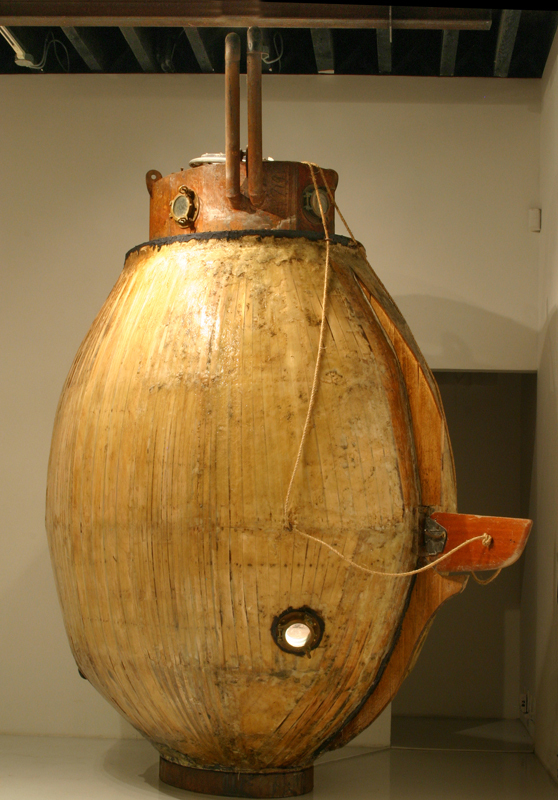 The one manned wooden vessel reached the ship successfully, but was unable to attach explosives to its hull. Although the mission was a failure, this unorthodox guerilla tactic embodied “the spirit of 76.” Individual acts of selfless courage combined with Yankee ingenuity allowed the revolutionaries to overcome a superior military force. Valuing liberty over life is the core of the American patriotic identity. At the time, the predominantly loyalist New Yorkers and the British troops were horrified by what they viewed as a cowardly insurgent attack. In 2007, I reenacted the Turtle’s mission. I built and launched a similar submarine in the direction of a new British ship invading New York harbor, I successfully navigated to within a few yards of the Queen Mary 2 before I was arrested and my sub was confiscated. Despite billions of tax dollars spent annually on homeland security New York harbor is no less permeable than it was 10 years ago or in 1776. 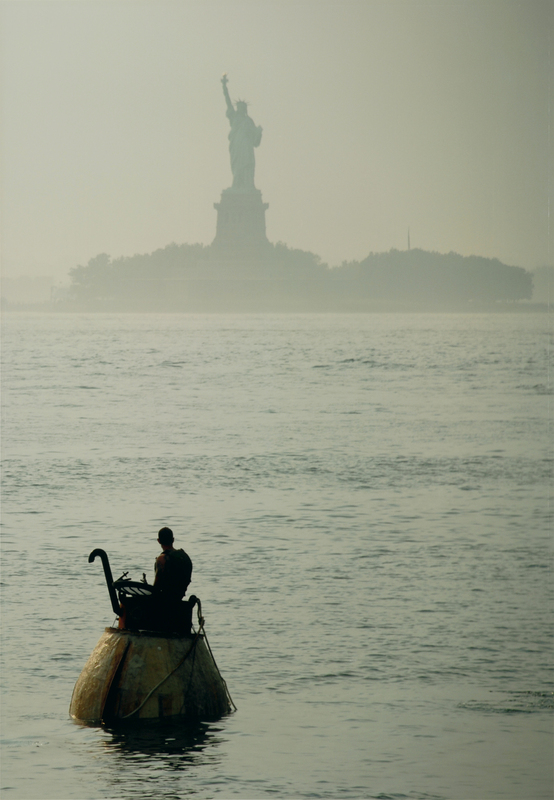 The final project combines the submarine re enactment with an alternate history of The Battle of Brooklyn. Factual Information regarding a seditious General’s reconnaissance mission and an invaluable multi-racial naval regiment are woven into folklore. A mythical liberator resurfaces from the bottom of the harbor centuries later to restore a derailed national objective. The war on terror in the U.S. and abroad mirror the American Revolutionary War on many levels. This time, however, our role as the military superpower as well as our ideology has inverted. Those who oppose us must resort to new tactics of destruction and terror. In our effort to squelch these attacks, we have compromised our civil liberties in favor of heightened security measures such as the Patriot Act. This undermines the founding principles that true patriots fought to establish long ago. I had the ribs cut on a CNC machine to save time. CNC’s were big back in 1776. My friend, Alex Perfido helped me get the sub started at his shop. Pneumatic nail guns were big in 1776 too! Eventually, the sub got too big for Alex’s shop. My friend, Matt Bohner, let me finish it in his shop in Red Hook. Jonathan Schipper helped me with the metalwork. Matt masterminded the launch of the sub. Everyone in the neighborhood showed up to help. ‘Peace’ helped me attach the rudder. It took about 11 hours to get the sub in the water. …and then I pumped in water to get it to sink. Busted! But I got pretty close. I had to wait for the tides and the QM2’s schedules to align. When the flood tide began, I prepared to cast off. News crews started to arrive. By this time I was already locked up. where we had launched it from. I wish I’d had this flatbed truck for the launch. Most of the officers really seemed to like the sub. So they held onto it for a couple of weeks. At the Randall’s Island impound lot.